Struggle with drawing lips in the 3/4 view? With this method, you’ll be drawing perfect lips every time! Since my first lip tutorial was so successful, I decided to base this one off the same idea of drawing lips using a simple triangle. If you liked that one, you’ll enjoy this even more! (If you haven’t tried my first tutorial, I suggest you do that first before attempting this one. Click here). You can apply what you learn in this tutorial to this one on drawing a face from the ¾ view. Using an HB pencil, make a straight vertical line. Add another line going through it that is slightly angled. Make a curve close to the top of the triangle. This is the cupid’s bow. The distance of the curve to the base of the triangle will determine how big/thick the lips will be. Draw a long shallow curve halfway down the triangle. The length of this line will determine the width of your lips. Since the triangle is facing towards our left, the left side of the lip should be less visible, so draw your curve shorter on the left side and longer on the right side of the vertical line. Finish the outer rim of the top lip by connecting the cupid’s bow to the predefined corners of the mouth. While staying inside the triangle, draw another curve that sits on the outline created in step 4. Depending on how much you bring this part forward (left) or back (right), you can end up with a strong overbite or underbite. Complete this section by following along the rest of the outline. Draw the bottom lip by starting at the base of the triangle and then curving your line up on each side. The curve drawn for the bottom lip does not need to touch the corners of the mouth. If the bottom lip looks like it’s coming out too much, simply erase and position it more to the right. When you’re done, erase all the guidelines. Use any realistic shading technique of your choice. For this example, I’m going to use the contouring method. It’s great for shading lips because the lines help to create realistic lip wrinkles/texture. The more curved your lines are, the more plump the lips will appear. With an HB pencil, use my Shadow-Lining technique to do a rough outline of areas you want to highlight or areas of shadow. Then, shade outside the Shadow Lined areas. Use an HB, then 2B and finally a 4B to build up depth in your drawing. It’s okay to shade into the areas you Shadow Lined or even change it up slightly as you go along. If you want the lips to look very glossy, make your highlights as clean as possible and your shading less gradual. Use a blending stump to smooth out your shading. Blend using the same motion your contour lines are flowing. Do not blend from light to dark. If your highlights are too dark, pinch your kneaded eraser and mold it into the shape of a curve similar to your contour lines and press it along areas of the lip you want to lighten. Continue to lighten your highlights or even add softer graphite to darken areas such as the creases, corners of the mouth or shadows under the bottom lip. This step is completely optional. But I highly encourage it because it may take your artwork to a completely new level. Depending on your preference, use your left or right hand to navigate your mouse down to the share buttons on this page and click on any social media platform to share this awesome tutorial with your friends! 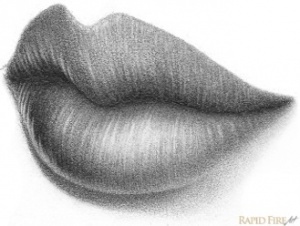 Wanna share your 3/4 lip drawings with me and other RFA readers? Submit your artwork via the contact page and I’ll post it in the gallery! How many tries did it take you to successfully draw lips in the 3/4 view? What steps did you struggle with the most? Let me know in the comments below! Hello! Is there any way that I can send you the drawing that i had some issues with it and maybe you can help me draw the lips…? The next one is going to be on drawing lips from the front!